Oak Point Events is a beautiful event facility in the Sacramento Valley. 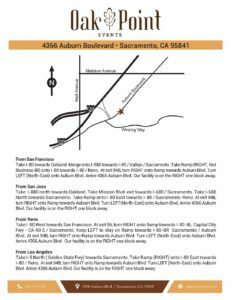 Conveniently located just 15 minutes from either downtown Sacramento or Roseville, it has very easy access to I-80. Our 1700 sq. ft. facility offers ample parking and can accommodate small to large corporate events. Several hotels are located within a five mile radius and provide complimentary transportation. We feature a beautiful new hall with unique lighting, new sound systems, video projector and a screen, wireless high speed internet, new and upgraded kitchen appliances, warm and inviting large entrance/lobby area, fully equipped executive conference room and meeting center. Oak Point Events can host special events such as weddings, receptions, quinceañeras, private parties, proms, casino nights, sweet sixteen parties, anniversaries, brunches, rehearsal dinners, graduations, conferences, trainings, seminars, ceremonies, private classes, bridal showers and bachelor/bachelorette parties, CD releases, Christmas and New Year parties, and more.